Unlike modernism, contemporary art is immersed in the present and engages with existing conditions. It can be seen as a way to access concepts and energy that form a culture by employing dynamic combinations of materials, methods, ideas and subjects. Wahab Jaffer is one of Pakistan’s most renowned abstract artist whose contemporary approach in exploring the female form, using bold colour palate and cubist form of depiction, has been showcased both in his home country, Pakistan and abroad. 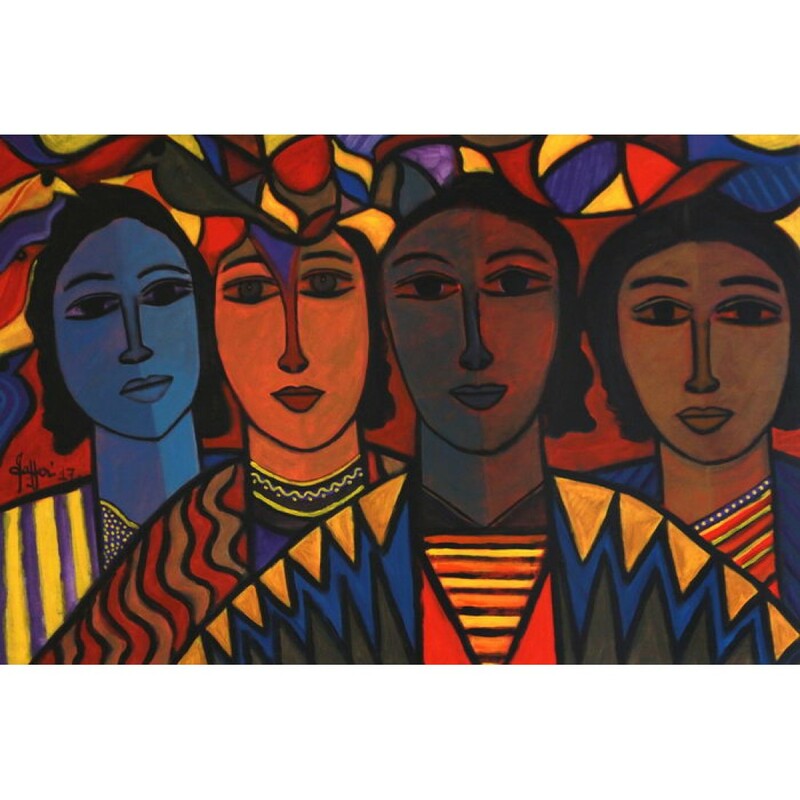 Born in Poona in 1941, Jaffer became interested in art and painting at a very early age. He held his first solo exhibition in 1981, at Indus Gallery, and later a series of exhibitions in different parts of the country. Not only in Pakistan, but Jaffer’s work won international acclaim and has been displayed in the Asia Pacific Museum in Pasadena, California in The United States, at the art gallery of Peel’s in Brampton, Ontario, in Canada, and also at the National Gallery of Modern art in Mumbai, to name a few. He belongs to an era that culminated in the Pakistani art scene taking on a new vitality where artists were able to express their individual creativity in a better way. Hence, he is one of the few artists from the same era who had the privilege to interact and learn from master modernistic artists like Ismail Gulgee, Bashir Mirza and Ahmed Parvez. Having displayed his artwork at several previous exhibitions around the world, Jaffer again fascinated and astonished art lovers with his signature abstract work in an exhibition that opened at Art Citi on May 3rd, 2018. Throughout his work, we observed an intense exploration of colours and shapes. The paintings on display had a very strong palette of bright hues, smooth lines and simplified forms. 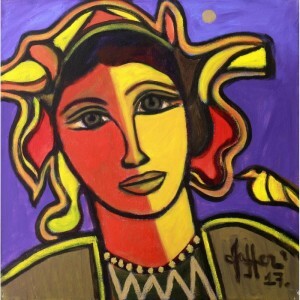 Feminine faces, birds and vases dominated his work, creating a salubrious affect. 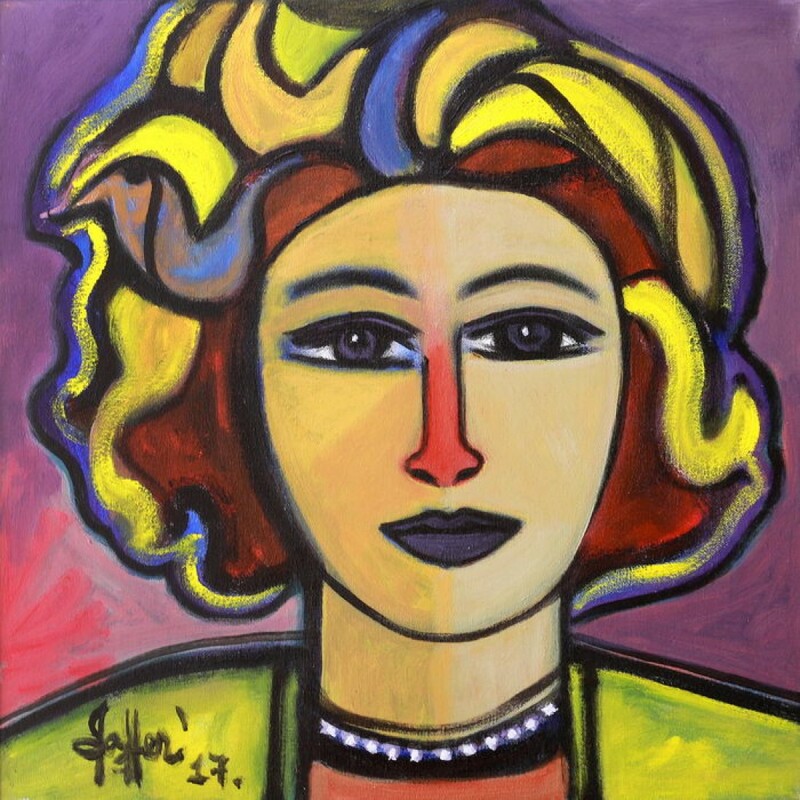 On a closer inspection, one could see how he used his cubist approach to simplify the female form that successfully elevated the mood and attitude of the women in Jaffar’s work, by using flat colours to enhance their features such as their eyes, lips and their nose. However, elongated necks, broad shoulders and dividing faces into equal halves with different tones, made the richfullness of his palette more prominent. These figurative paintings had similar expressions but chaotic lines that created a psychedelic experience for the viewer. However, the cornucopian heads of the women were treated very differently than the simplicity we see on their faces. His bold abstract and starkly style drew our attention towards the heads of these women that had a resemblance of a feminine hat or a crown, with birds often appearing in the composition. Birds are an important component in almost all his paintings, emerging either from the hair accessories and vases or just placed in the background. Jaffer had maintained a strong and enigmatic style that makes his work personal and exclusive – though he overlooks the intellectual explanation. According to him, the inspiration for his artwork comes from his mentor, Ahmed Pervez, and one can see the shadows of Pervez’s work in Jaffer’s art as well. His work came across as doodle like surrealistic work, composed of smooth strokes distinguished by dark and light tones. The unique allure of Jaffar’s oeuvre dealt with colour as a subject that enticed the viewer to enter the world of fantasy. Not only did he create an open dialogue through his work, but also contributed to the Pakistani art scene by being recognised as a passionate art collector, whose guidance and appreciation of art and culture makes him a very important individual of our country.